Looking back 40, 30 and 20 years ago, the following are excerpts from the Artesia Daily Press from Aug. 13-19. As reported in the Pinon News: Jack Larkey of El Paso wrote to report the sightings of what was thought to be the black panther. Roy Sellers of Timberon reported seeing a large black animal near the Bob Williamson’s home two weeks ago that looked very much like a large cat. Mr. Larkey also reported Irving Porter’s prize horses had received multiple scratches and cuts recently, and investigating he discovered large cat tracks. There is some concern in the area, as the supposedly black panther is entering the populated area of the mountains. Kelli Rogers was named as the 1978 Pioneer Days Rodeo Queen Saturday night, climaxing the competition of five girls – Rogers, Audrey Faught, Marie Johnson, Cindi McIntosh, and Paula Rhyne. The winner was determined by her number of rodeo ticket sales and horsemanship. Rogers is the daughter of Mr. and Mrs. Jessie Rogers, south of Artesia. Construction of a shopping center which will house a K-Mart and other stores is scheduled to begin in Artesia within 30-45 days, Dean Dauley, of Grand Prarie, Texas, one of the developers of the center, said today. The complex is to be constructed west of Eagle Parkway on Main Street, and the $2.5 million project will contain a K-Mart discount store, a drug store, a department store, and a supermarket, with space also available for eight or nine other shops, Dauley said. Normally, when the end of summer or the beginning of fall rolls around, most of the high-school-age males in America begin thinking of football – whether they want to play it, coach it, or cheer for it – but in Lake Arthur, the fall of 1978 ushers in a whole new idea for them – something to do. With the creation of a three-team six-man football league in New Mexico, of which the Lake Arthur Panthers will be a part, it ends a long period of time when male athletes at the school had little else to do athletic-wise in the fall other than take part in their P.E. classes. Tom Hopper, 30, will be coaching the Lake Arthur Panthers this fall. Becky Joy of the Artesia FFA chapter showed the Grand Champion Steer at the 1988 Eddy County Fair. The 1,202-pound, 1 ½-year-old animal was sold at Saturday’s auction for $2,600. Combining to buy the steer were Navajo Refining Co., Valley Federal Banks of Artesia and Carlsbad, First National Bank of Artesia, Western Bank of Commerce of Carlsbad, United New Mexico Bank of Carlsbad, and Western Bank of Artesia. Wade Mulcock showed the Reserve Grand Champion steer, which was sold at auction for $1,750. Barry Coffman is the head football coach of the Artesia Bulldogs. The Coffman Era at Artesia High School officially began last spring, when Coffman, 39, was hired by the Artesia school board. He comes to Artesia from Dumas, Texas, but is no stranger to Artesia football, as he has coached at Hagerman, Bloomfield and Aztec. 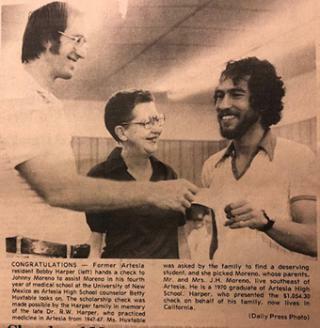 His Bloomfield and Aztec teams tangled with Artesia in the late 1970s and early 1980s. Lamb judge Terry Phillips congratulated the winner of the Senior Showmanship Award, Brian Taylor, after competition among senior lamb exhibitors Thursday. Phillips said he narrowed the showmanship competition down to three. Second was J.J. Hefner, and third was Tami Payton-Bratcher. All three are of Artesia. As reported in the Pinon News: Rains have fallen over most of the mountain areas the past few days and the grass is really growing and such a beautiful green and where it has been raining the grass is heading with seeds. Monday afternoon, while the Holcombs were returning from Alamogordo, they were coming down Cox Canyon and when they met cars they would blink their lights. Finally, Basil stopped a car to aske whey they kept signaling. It was Mr. and Mrs. Ray Day from Sacramento. They reported flood waters were going down the road so they were going back to Cloudcroft and down James Canyon. The Holcombs went on to see and at the old Bass log house, now belonging to the Carners, the flood waters were pouring off the hillside, apparently where the waters were turned out of the canyon. The water was sending large stones and wood down the highway, making it impossible to go on. A number of cars and pickups came from each side and looked it over and turned back. As the Holcombs were going down James Canyon, there was heavy muddy water pouring down some of the canyons into James Canyon. As reported in the Pinon News: Mrs. Oza Holcomb was having trouble with her deep freeze and had Drue Goslin come and chick it for her and found the trouble in the electric cord. She was quite happy about it an ordered a new cord.